Nothing accentuates a home office more elegantly than the perfect awards and flag display, and in this case a solid oak or walnut flag display case. Our handcrafted, quality Scout Deluxe Awards and Flag Display Case. Enhances the appearance of your collectibles. Nothing accentuates a home office more elegantly than the perfect awards and flag display, and in this case a solid oak or walnut flag display case. Our handcrafted, quality Scout Deluxe Awards and Flag Display Case. Enhances the appearance of your collectibles. Each case is artfully assembled by hand. Made of handsome, durable, solid oak and walnut wood, our displays are made with a sense of pride and respect for craftsmanship. Inside the flag display case is room enough to hold a 3 ft x 5 ft folded flag (flag is sold separately, see our Cotton American Flags). Constructed of only the finest solid oak or walnut, this case has a laminate panel back with hanger, an embossed 2 1/2-in. service emblem, crushed velvet background and a glass front. Optional personalized laser engraving is also available. The size of this case measures 18 inches wide x 20 inches tall. Our scout flag display cases are perfect for displaying flags from all types of scouting, such as Cub Scouts, Boy Scouts, Girl Scouts and Venturers. 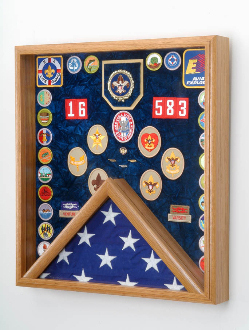 Flag display cases have a certain charm unmatched by other memorabilia displays because of the presentation of the timeless keepsakes found inside the case. Of course, framing these treasures in elegant and distinguished fashion is key. Recognize those young achievers with the Flag Display for Scout Awards at all levels of scouting, and whether it�s an eagle scout recognition or tenderfoot rank advancement, they can all be made special with a little effort. Our products can bring elegance to the most ordinary of home hallways, office walls, corridors or club or association headquarters. The right flag display showcase not only shows off the beauty of what�s inside, but keeps it preserved and secure as well.